I’ve never traveled along the western US coastline waaaay up into Oregon. 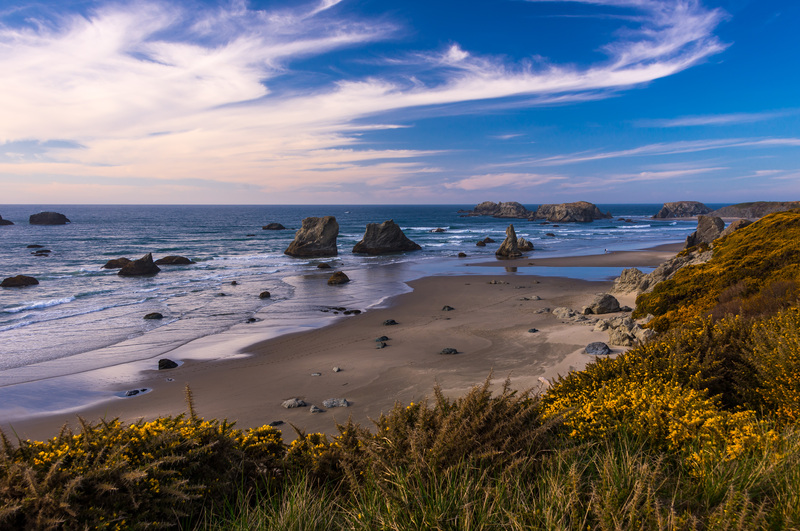 We want to spend some time exploring the entire Oregon shore later this summer, and thought we’d scout some RV parks in Bandon and Coos Bay after we accompanied Barb that far north on her way home. 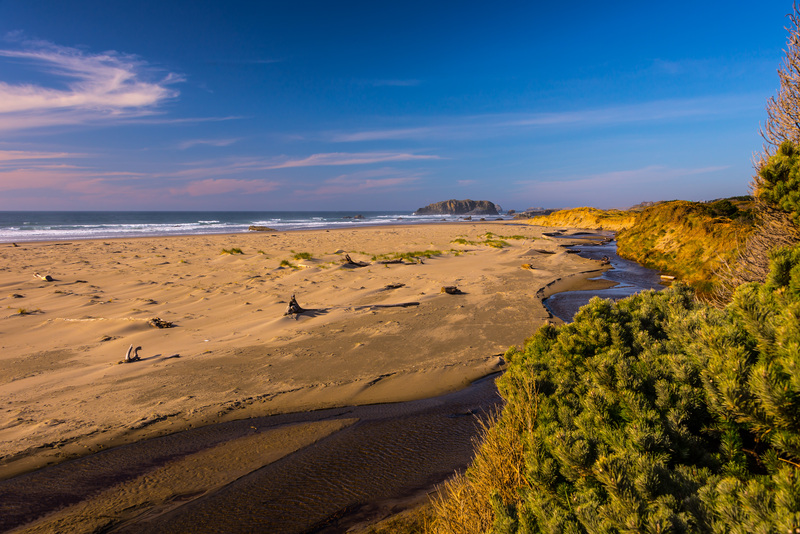 I don’t know…Bandon…look like a place where we should spend some time? Is there more than sand and water and big rocks? It does seem fairly inviting. I wonder if we can just relax there…. My parents died over 10 years ago, but my father’s widow remains alive & well and dear to our hearts. 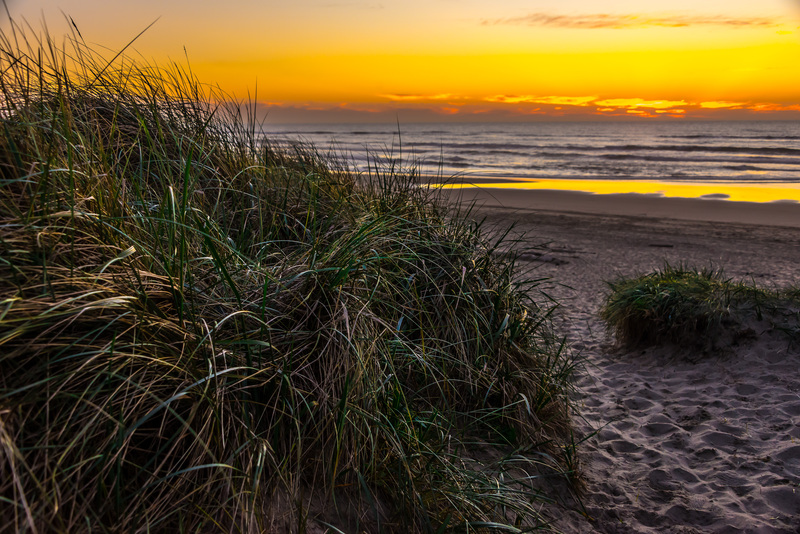 She lives in Tillamook, OR, and we have been trying to figure out how to get the coach up her way so we could spend some time with her…and explore that great northern Oregon coastline! She decided to make a run down our way…mostly as a lark, but partly to see what it was like to travel that far by herself. We can tell you for sure now…she’s a winner! Shucks, we never had any doubts! Grandma Barb was here for only two days and three nights, so we had to run her ragged to get in all the sights we’ve seen for the past two winters out here on the northern CA coast…. 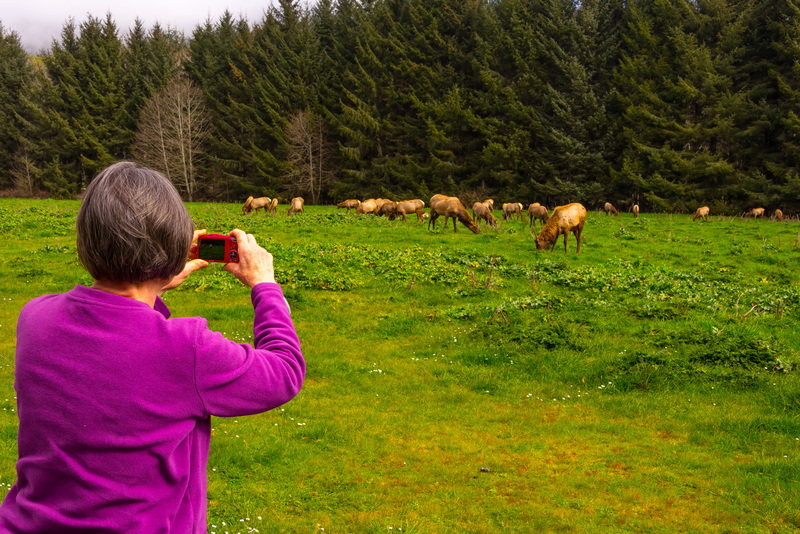 On our way to walk in the Tall Trees, we spotted one of the herds of Roosevelt Elk…yessss! 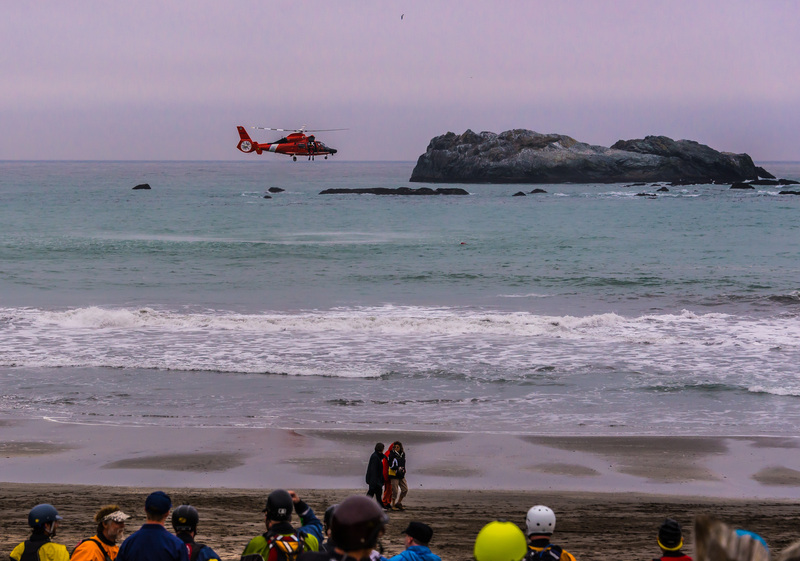 Then, while on a tour of Trinidad’s beach, we saw people gathering near the parking lot and heard the familiar engine-and-prop sounds of the local Coast Guard helicopter. HA, everyone but us knew there was going to be a rescue demonstration right there! 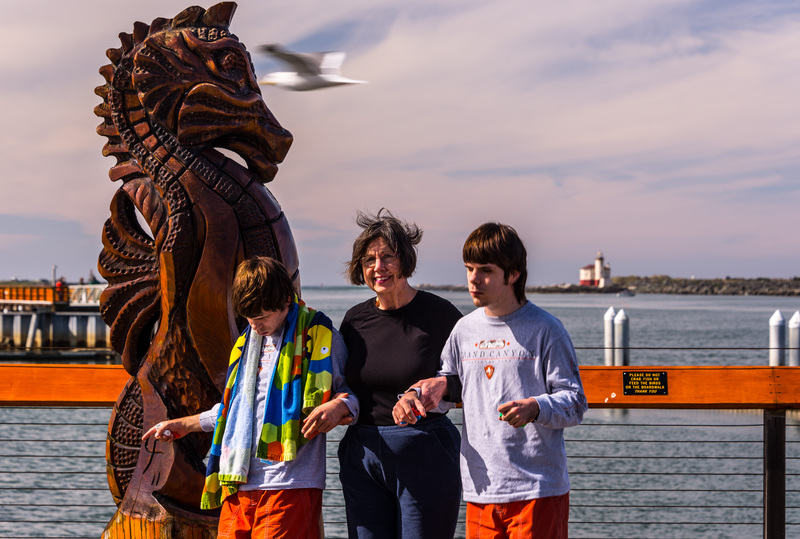 In the picture, Barb is walking with Robyn and Ryan down near the water’s edge. Notice the legs of the CG rescue swimmer hanging out of the chopper door…by the time he actually started descending, Ryan had pulled Robyn and Barb out of the picture! You can see we managed to cover two or three area highlights on each foray, so managed to give Barb a pretty thorough view of our circumstance here on the North Coast. We were so reluctant to see her leave, we loaded in our car and followed her up the coast as she headed home! We gave her a walkie talkie to use, and we played tour guide for about 100 miles…but we finally had to say goodbye…. We stopped in Bandon, OR to say goodbye to her, get a picture with her on the waterfront, and waved as she drove off. But we hung around town to scout a place to park for a week later this summer….after we return to Dayton in April, go up to Michigan for routine maintenance on the coach, stop by Kokomo, IN to see Robyn’s mother and sister, stop by Chicago to see Jared, stop near Denver to scout the Rockies, stop in Tillamook for a month with Barb, then come down the coast on our way back here to Arcata, CA in July! The night sky is a fascinating place! I follow several photographers on Facebook…the new frontier for modern photographic processes…who each post about a photo a week that shows some exquisite night scene they’ve captured. Night photography has been growing by leaps and bounds because of improvements in cameras. The best cameras now have sensors to record their images that are the same size as the old 35mm film images…rather than about half that size. Size matters, but the biggest effort now is to develop pixels that can record what I call “deep and wide” information. Rather than just throw more pixels on a sensor…so they get smaller and smaller…the technology is devoting attention to making larger pixels that are more sophisticated. Sony sells a camera whose pixels can record a range of exposure that is about five to seven times greater than the typical sensor AND can operate up to a sensitivity of ISO 25,000 without appreciable noise. Just two years ago, a camera that could shoot at ISO 1200 without much noise was doing very well! So suddenly everyone wants to shoot the Milky Way above Delicate Arch in Utah at what looks like noon…. Until I get there….physically, and up to par with the technology…here are some pictures I took a few nights ago. All three show the moon taken about 3 1/2 hours after sunset. The moon was only an 8% sliver. Each picture was taken from a slightly different vantage point that overlooked the ocean. Click on each one so it will fill your screen. Notice in the first image, the camera is able to slightly over-expose the bright sliver of moon and capture the dark portion! Even a small sliver casts a bright reflection on the ocean waves. Only the brightest stars show. In the second image, the moon is soooo over-exposed it shows as a bright ball and creates some flair as a small hot-spot above. As I took this photo, everything in front of the camera was utterly black except the sliver moon and some of the brighter stars! The bright reflection burning toward the camera could not be seen at all with the naked eye! 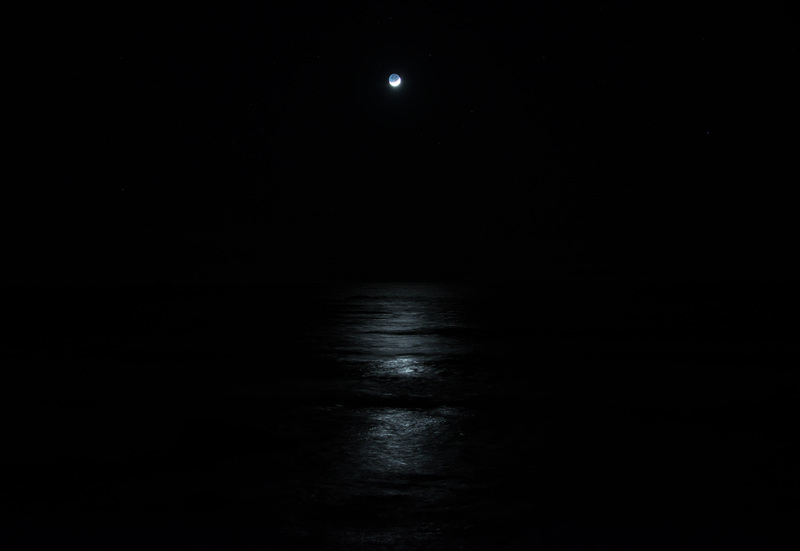 The bright spot on the water near the right edge was from car headlights in another parking lot overlooking the ocean. 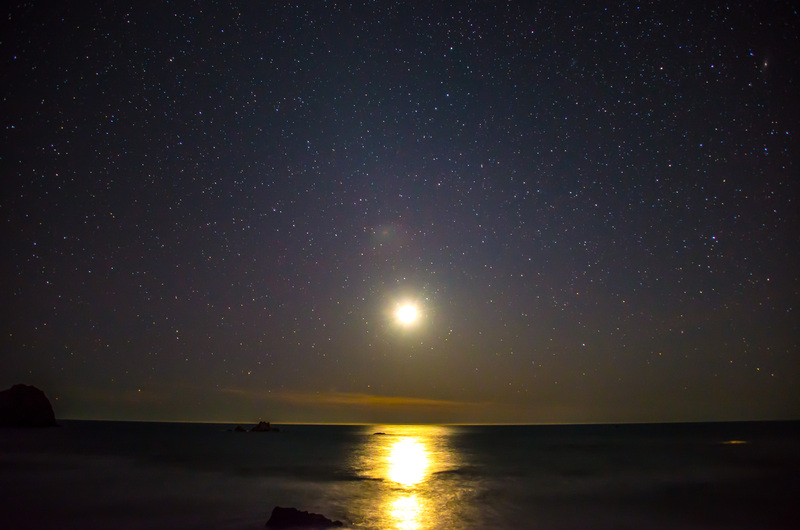 The final image shows the moon just moments before it slipped beneath the waves. Its orange color results from its light passing through the Earth’s atmosphere at a low angle. You’d swear it was a sunset…except for the stars! 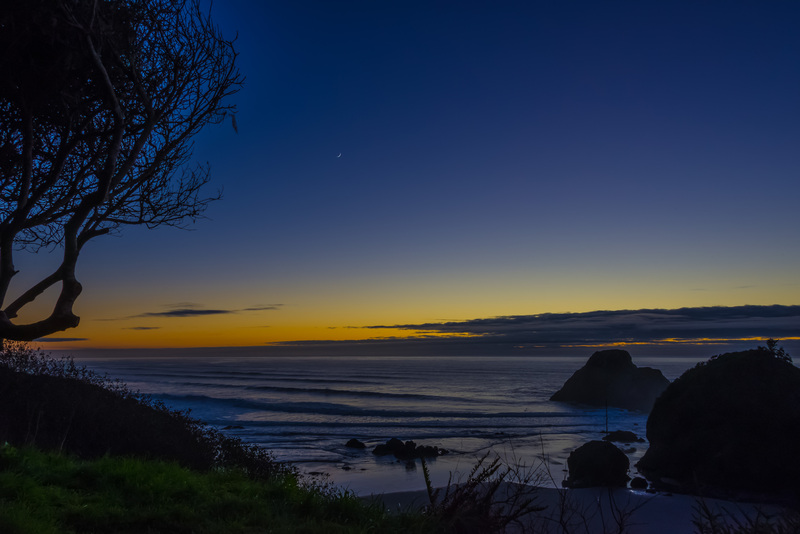 We’re on the beach in Brookings, Oregon…at low tide…at sundown. See the greenish band on these rocks? 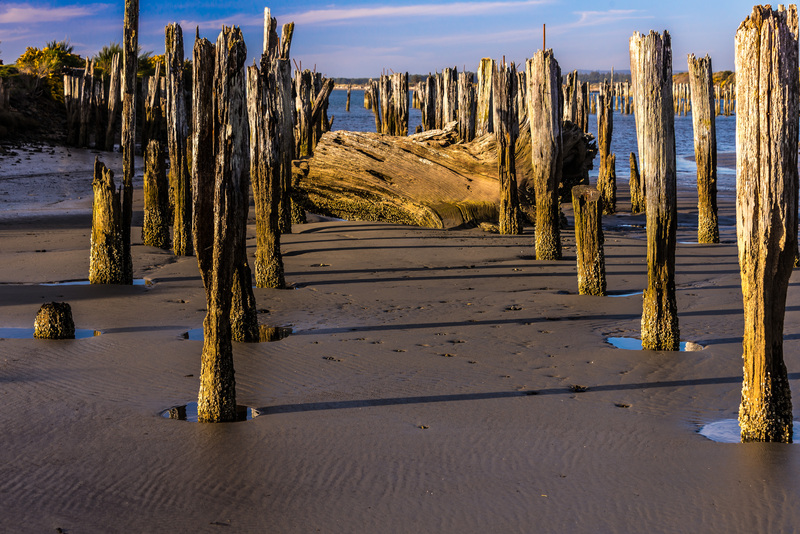 At high tide, the ocean routinely washes just above that height…over our heads as we stand here on the sand. But we can afford to ignore the ocean right now, because it’s waaaay behind us….and we want to get a picture of the moon that started rising before sunset. Whatever it is about the moon in the sky, it’s even more cool to catch it when the landscape beneath is still lit by the sun. 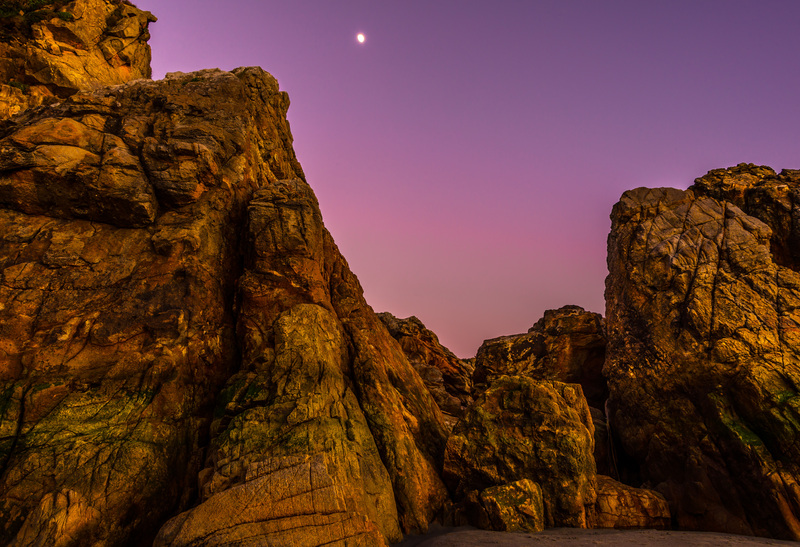 Even the rocks point to the moon! In the preceding post, did you notice the heron at water’s edge? Well, did you notice the moon? 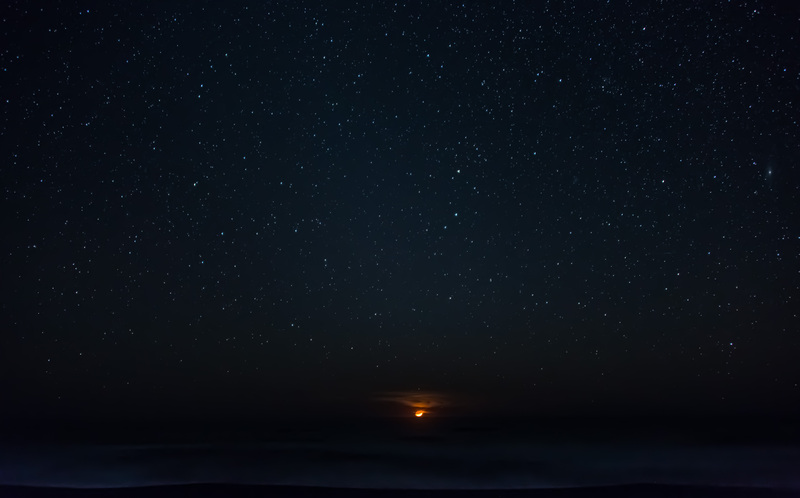 No matter how compelling the scene, that sliver of moon up in the dark sky just seems to add something special. The darker the sky, the more fun the moon adds…even to the point of creating shadows at your feet as you stand there looking up. This picture was taken as the moon was an hour from setting in the western sky, about 90 minutes after sunset. Pretty amazing how much color remains on that horizon from the sun, eh? 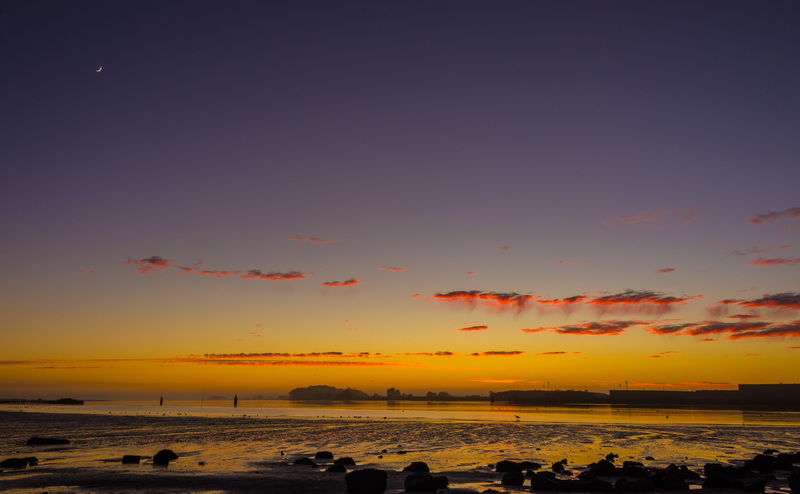 All those brilliant colors and engaging seascape…yet that tiny eyelash of light almost takes over the scene. Professional photographers say that a moon in the image grabs people’s attention quicker than anything…even when it’s just a sliver. The previous post showed you the magnificent full moon at night over Trinidad. The moon and the sun play an interesting game of tag. They both rise in the east and set in the west. When the moon shines as the smallest sliver…a new moon…it tends to rise and set about the same time as the sun, and is therefore very difficult to see. The full moon, on the other hand, tends to rise and set almost exactly opposite to the rise and set of the sun, which makes for some really interesting opportunities. Why wait until after sundown for the moon? 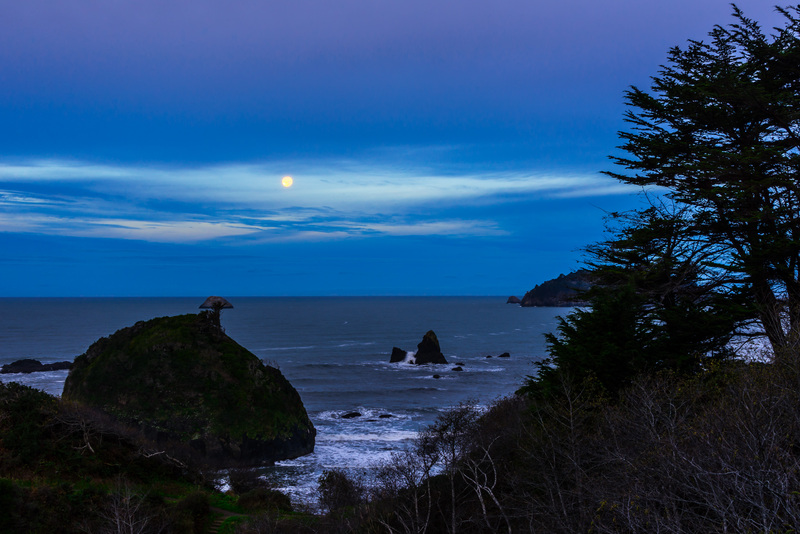 The photo below is of the setting moon…just minutes before the rising sun! It turns out those opportunities are much more difficult to photograph than you might imagine…mostly because the moon is soooo bright! I’m pushing my photo skills to improve pictures that include the moon, and will share several this week that represent early efforts.